Today I’m excited to have Susan Su on the show. Susan has worked with a bunch of well known entrepreneurs including Ramit Sethi of I Will Teach You To Be Rich and Noah Kagan of AppSumo. She has a ton of experience with email and content marketing specifically targeting small businesses and is a partner at 500 Startups today. Now if you enjoy this podcast please leave me a review on iTunes, and if you want to learn how to start your own online business be sure to sign up for my free 6-day mini course, where I show you how my wife and I managed to make over 100K in profit in our first year of business. So go to mywifequitherjob.com, sign up right there on the front page, and I’ll send you the mini course right away via email. Now before we begin, I want to give a quick shout out to sitelock.com for being a sponsor of the show. SiteLock is the leader in website security, and protects over 8 million websites by monitoring them from malicious activity 24 hours a day, 7 days a week. So here is the thing, most online business owners never think about security until they get hacked. My online store got hacked long ago, and it was the most miserable experience ever. Steve: Welcome to the My Wife Quit Her Job Podcast. Today I’m excited to have Susan Sue on the show. Now it was actually pretty random how Susan and I started talking. Recently she spoke at the Unbounce conference and used one of my emails as an example in her talk. And one of my friends who was actually at the conference let me know that I was mentioned by Susan. And so I looked her up, noticed that she was a Stanford alumnus with a lot of mutual friends, and so I reached out. Anyway Susan has worked with a bunch of well known entrepreneurs including Ramit Sethi of I Will Teach You To Be Rich doing marketing. She’s also developed email marketing campaigns for AppSumo, Noah Kagan’s company, and right now she is at 500 Startups. 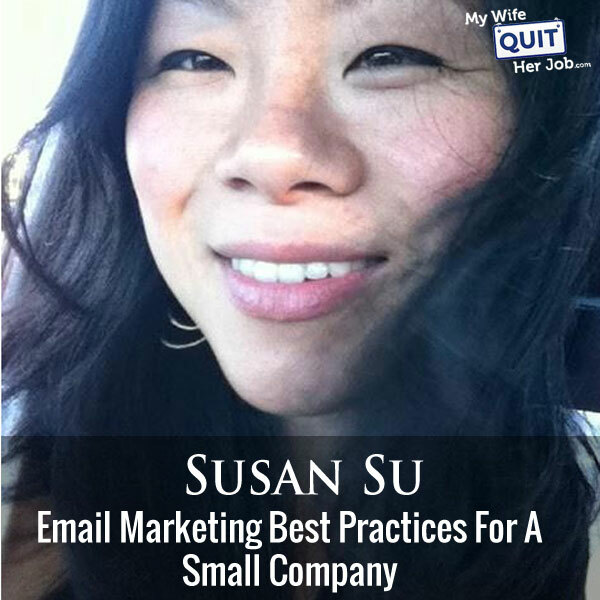 But the reason why I decided to have Susan on the show today is to talk about email, and her content marketing experience. And with that welcome to the show Susan, how are you doing today? Susan: I’m doing great, thank you so much for having me Steve. Steve: Yeah, before we start give us the quick background of how you kind of got started with — I Will Teach You To Be Rich followed by AppSumo, and then how did you guys hook up? Susan: Well it’s a really funny story. I actually was already — I was in a job at Google at the time when I first met Ramit. And I wasn’t very satisfied with my job like Google. Not that there is anything wrong with Google, but I’m just not a really big cooperate type of person, and I was looking for a new job. And after months and months of what seemed like picking on a part time job of job searching, I finally got contacted by a recruiter for a mid kind of mid stage, I think post series B startup in San Francisco in my dream city. I was living in South and Silicon Valley at the time. This recruiter said, hey we got a really great job for you, we would love to bring you into the company and so we started talks. A couple of weeks later they had an offer for me and I had been reading this book about negotiation and about how women never negotiates their salaries. So I thought I’m not going to let that happen to me, I’m going to negotiate. However, because I was very inexperienced and it really was my first time ever doing that, and I hadn’t practiced, I basically botched it. I named — I did the number one mistake which was I didn’t do my research. I named a random number, I don’t know where and I basically lost all of my true confidence and just kind of was very random things random things. So I went to Ramit for help not because I knew Ramit, but because I had read about him in the New York Times, a trusted source. And I said, “Hey Ramit, you don’t know me, but I also went to Stanford,” and I explained to him the situation and I said, hey is there anyway you can help. And he actually replied within like I don’t know 10, 15 minutes. And he said I’m willing to help you if you will meet me at the this random dally in the middle of Redwood Shores which for anybody that knows the Bay Area Redwood Shores is not a major upper center of startup activity, it’s pretty in the middle of nowhere. In the middle of the day — Oh sorry it wasn’t a random dally; it was kind of like a diner or a denise type place. In the middle of the day and you will let me record you. And I thought I’m going to do it, this is worth it. And I guess he was so impressed with my ability to get past his barriers that he put up sort of as test that we made friends, we kept talking, we talked more about negotiation. I did a bunch of free work for him which I always think is really key if you are trying to get to know high potential entrepreneurs and founders. And some months later I ended up leaving my job, and working with him fulltime. Steve: Okay and then for him what were you doing, were you doing email stuff? Susan: We were doing some email stuff; we were doing a lot of different tasks. He had just published — he had just finished the book I will Teach You To Be Rich. And I just published it, and had marketed it to become its own New York Times in Amazon and Wall Street Journal best seller. Not thanks to any efforts of his publisher, but all thanks to his own marketing efforts, which I thought was really incredible. And everybody at that time was saying hey Ramit, when is the next book going to come out? And he would just basically laugh quietly behind their backs, because he could see that they didn’t understand that really it really wasn’t about the book. Steve: I was an affiliate for that a long time ago. Susan: Oh yeah there you go. And there is a whole lot like email marketing was a huge component of it, but it wasn’t just email marketing. I mean a lot of it was creating the content itself, trying different continuity programs, trying different landing pages. So yeah it’s when you are very early, and you are just kind of running a lot of experiments at high velocity, usually the teams can’t really afford to have such specialization as like, okay this person only will work on email marketing. Actually it’s more like that person’s got to do email marketing as one of the 10 things they need to accomplish today. Steve: Yeah, jack of all trades basically. Steve: Yes so but I – the reason why I came across you was you’ve been speaking at conferences lately and mainly focusing on email and content marketing. And so I know for me at least email, the automation aspect is key, because I don’t have much time and I don’t have an army of employees. And I kind of wanted to talk today about some of the best practices that you kind of talked about, or have been talking about on improving the open and click through rate of emails and also the delivery rate. And I was hoping if you could just go over some of the best practices that you’ve been taking about. Susan: Sure, I would like to start with the best practice; I think it’s a little bit counter intuitive, one of the biggest enemies to your open rate. And actually I haven’t really talked about this at any conferences or publicly yet, but I think it’s worth noting. And you specifically reminded me of it Steve, because you mentioned the word automation. One of the biggest enemies is actually believe it or not it’s actually not emailing frequently enough. So many people are afraid at least in a startup world, now I have advised dozens or probably by now over 100 startups on their email marketing. And most of the founders that I encounter are specifically afraid of being too spammy. Those are like that’s their exact words. But is it going to be too spammy if I email them this week and next week, something like that. Or if I email them twice a month, is it too spammy? Actually what they don’t understand is that it’s much spammier if you email your recipient once in a blue moon, and that affects both your open rates, and well it affects primarily your deliverability rate and it affects your open rates as well, because you are this kind of weird out of the blue unfamiliar sender. The number one like kind of step zero thing that they find and you can do to help your email marketing efforts, is to set a frequency that’s probably about twice the frequency that you would naturally feel comfortable with, just assuming that most people err on the side of being risk averse. Steve: What would you say would be the minimum frequency that you recommend? Susan: It depends on the type of business. It can really vary, but let’s say you are doing an ecommerce, I would say you need to — especially when you first meet somebody, I mean sorry I always think about it in terms of meeting people. When somebody first subscribes to your list to have at least four touches per week, or even five or more depending on what type of category your business is in, and what type of subscribe that is. But if you are only having one touch with them this week and then one touch with them next week, that’s too far apart for you to stay top of mind. So most people receive over 500 marketing messages in their inboxes per month, and that’s not even your highest value customers. That could be even higher number if you are emailing people that subscribe to a lot of products, or that are really active consumers. And so to cut through all of that noise, if you are sending one email a week or three emails a month, that’s three out of 500 plus or 600 marketing messages that they are getting. Just the sheer percentage is so, so low. How do you expect to really stay relevant to their experience? Steve: So this is like the Facebook newsfeed in away, right? Only a small percentage of your messages are getting through, so you want to post more often just on the chance of one of them will actually get through, is that accurate? Susan: That’s right, and it’s interesting because everybody kind of gets that about Facebook, and well I won’t say everybody, but more people understand that about Facebook and Twitter. I think people are less afraid of posting more often or repeating themselves on those channels. But for some reason when it comes to email we think we have this — we are in this private room; we are in a one on one conversation with that recipient, which just by the sheer numbers is not true. So it actually in reality resembles something much more like a feed, and much less like that one on one conversation you are picturing. They are not pouring over your every word. Steve: What would you say would be the average opening click through rate of ecommerce email? Susan: It depends on the exact category of ecommerce, but if you are doing below 20% you can probably stand to do better, if you are doing above 20% then great. And the thing that I really like to watch for besides just open rate, the sheer open rate is really your drop off between open rates from email to email in your sequence. Susan: So if you can hold steady from your first email, your second, your welcome email, and your first few emails into your nth email, and when I say hold steady I mean have a delta of less than 10%, then you are doing a great job. Because you are not losing the people that are opening your email, and actually you are still finding a way to market to that same customer and continue to sell them the back end or whatever it is that you are selling. Steve: So when you are talking about the sequence, are you talking about like the first engagement sequence for an ecommerce store? Susan: Did you say sequence as the first word there? Susan: Yeah, so I always advocate and this is again related to automation, before you start emailing, really map out what your drip is going to be, so that it’s not up to on a Wednesday you think, oh gosh it’s Wednesday again, I have got to email my people, what am I going to send them today? And that just puts up such a barrier, and it also makes it feel like emailing is this like really like pulling teeth kind of thing, and it’s bothering them and all these kind of negative aspects of emailing. Instead what I advocate is setting up the whole journey as far in advance before hand as possible. And then you know okay when somebody goes into this journey it’s like going into the labyrinth in a positive way. Not the negative way of labyrinth, but the kind of that really makes people reflect more and arrive at some kind of positive conclusion. And so what I would — and that also helps you to automate your workflow and your operational process for creating the emails. So I would say, okay here is what I know. I know that I have got to send four emails in the first week, and the second week I want to send four emails. In the third week I want to send two emails. By the fourth week I’m going to put them on what I think of as the back pointer which is a weekly digest. And this would be maybe for like a smaller to mid size earlier type of company, maybe not exactly your Amazons, or your other largely ecommerce that’s going to be emailing at a very high frequency, but yeah but something smaller. And so knowing that you’ve got about 10 to 12 emails that you want put out, just seeing it all from this advantage point before you get started you realize, okay great I have got 12 emails I need to write, that’s not that many. And try to write them all in one go so that they really form a cohesive journey. It’s not automation per see in that you don’t have to do anything, but the sending of those emails it becomes an automated process once it’s under way, because you’ve already created the content, and then now you can just tweak things like the subject line, the times, and a segmentation. Steve: So to just kind of summarize what you were saying in terms of frequency, you recommend sending emails out almost like on a daily basis for like the first several emails, and then gradually reducing frequency, is that what I heard? Susan: I do and that’s just the most basic formulae. I would say if you want to get more sophisticated or if you are more sophisticated, or you have more resources to dedicate to it, I actually would create, I would advice creating segments based on the type of user it is. So if it is somebody that’s really active versus somebody that’s less active, you know people that are less active, it’s probably not going to activate them to send them more and more and more emails. However somebody that’s really active, you know you probably don’t really need to do that kind of tapering that you would otherwise be doing for your general list. If somebody is really active and they are really into it, and they are opening your every email in those first 4 emails, well why not keep going. Again for each person’s business it really depends on how many resources you have available to get really nuanced, but you can do a lot more with it. Steve: So you’re basically segmenting people who are clicking on the links within your email, and you are emailing those guys more often, whereas people who don’t open as often you might want to taper back the frequency. Susan: Yeah, I would certainly based on clicks, based on the actions, and I’ll also even just segments just based on opens. So I feel a lot of times people open but they don’t click, or better yet they open a bunch of times, so if they open a bunch of times, but they don’t click, that is telling me so much information. That’s telling me they are quite engaged, or even maybe they are forwarding it to their friends, and they are not taking action either because it is not appropriate to the device they open their email on, maybe they are mobile or what not, or maybe they are just a little bit unsure, but they like me. They are opening, so there is more that you can do with that segment as well. Steve: What about some tips on improving the open rate and the click through rate? Susan: Well I think the number one thing you can do, the simplest thing that you can do to improve your open rate which will also improve your click through rate by default is to make sure your sender identity is verified. It’s really, really simple, you can tell if the sender identity is verified or not. If you send yourself an email, and then you click, and there is a down arrow, if you are using Gmail for example there is a little down arrow next to the sender name, and it will say who it’s mailed by, and who it’s signed by. Super simple, it’s just a technical thing, you need to go into your domain manager, and just you know put in a couple of update or see name records, and you don’t have to be technical to do it. In fact all you have to do is Google your email marketing tool that you are using, let’s say it is MailChimp plus DKIM, or sender verification, and then just do the instructions. There will be a help center article about it, but a lot of people just don’t know it exists, a lot of really smart people. Even people who consider themselves marketers, they overlook this one simple administrative detail, and they are missing out on a lot of opens through that. So I always recommend you do that first before you think what fancy subject lines you can get going. Steve: Just for the listeners out there, so SPF and then DKIM, did you say SPF, I was putting words in your mouth, sorry. Susan: Yes SPF as well, and don’t worry about what it stands for, don’t get too caught up in trying to understand how it all works. Just go to the help center article for your email marketing tool, follow the instructions, and then you will never have to think about it about it again, just do it once and you will never have to think about it again. Steve: Actually even better, you can just call up like AWeber or CovertKit or whatever, and they will take care of that for you. One thing that I’m putting words in your mouth again, but this is good stuff in your presentation, there is just this place called mail-tester.com where you can actually send yourself a test email to see if everything was actually in fact working. Susan: Yeah, I always say there are more sophisticated, and paid tools out there, mail-tester is a really great free one. You can just check your sender score on a scale of 1-10. You should be aiming for a 9 or above. If you are not at 9 or above, then there is a lot more that you can probably improve in terms of your both deliverability rates and your open rates. And the main reason that you wouldn’t be at a 9 or above is if you are getting a lot of hard bounces, you are sending to an unclean list, or you are on perhaps some black list, for you know somebody marked you as spam whether on purpose or accidentally. Hey it happens, but thing is to make sure you clean it up and get off those lists, and you can quickly bring your score up to spike, little bit of decent clean up, you can quickly bring your score back up to a 9 or even close to a 10. Steve: I’m just curious in terms of open rate, like I get a lot of emails where I see my name in the subject line. Since I send out a lot of emails though, I know that this was just a tactic where I entered in my name when I signed up. Do you recommend people do that today? Susan: Actually I don’t because you know Steve if we were emailing each other about this podcast, coordinating things, and when you emailed me you cannot write me an email that says subject line Susan doing this podcast. You don’t use the first person; you don’t use the person’s first name in the subject line when you are writing to somebody that you really know, where that’s actually important to you. I don’t put my mom’s name in the subject line when I write to her, or my friends or my colleagues. It’s very unnatural, in fact now instead of a personalization flag which it’s intended to be, it now works as a promotion flag. You know, okay I get it, this one is a marketer that’s using first name in the subject line, they’re using that first name tag. Instead I recommend what I call next level personalization which is using things like people’s company name, because a lot of times if you know where somebody works you can use their company name to further personalize the subject line. Steve: Give me an example. Susan: Probably an example that I saw once from HubSpot a couple of months ago was, is 500 Startups landing page doing well? I thought, “Oh my God, I need to open this because this is about work, this is about my job, it’s my job to open this.” Actually it went to my personal email address, it went to my Gmail, but it got my attention immediately. I get tons of marketing messages in my Gmail every day, and that one got my attention immediately, because you know before I could even think about it my brain had already been triggered into that oops work thing, go to open. I was already I think three quarters all the way through the email before I realized it was a mass marketing message. Steve: How did they pull that off without collecting your info at some point though? Susan: They do, but so, HubSpot does collect your info, and I had forgotten. So that’s the tricky thing, a lot of times people enter their information in various places. If it is to download a special e-book, you know they have a special webbing page for that, I had entered my email at some point, and I just you know I straight up forgot. Look at me, I’ve got 20 tabs open on my browser right now, how I’m I going to remember if I gave you my company name, or my city or whatever it is? By the way city is another great way to do next level personalization, because people’s eyes are on the lookout for Miami, San Francisco, Fort Lauderdale wherever it is that they live, they are used to looking for that as a way to look out for content that’s highly relevant to them. Steve: What’s your view on collecting all this extraneous information versus just getting the sign up? Susan: I think it’s important to just get the sign up in the beginning. It’s the most important, just get the sign up, and you know just in the HubSpot example they didn’t collect the extra information right up front. They collected it later on when they enticed me with other cool e-books or free content that I wanted to check out, because honest to God did seem really valuable, but in order to access that information I had to add in more details about myself, like my company, my location, my job, my job title and all that stuff. Steve: Interesting, so what you are suggesting then is to just to get the email in the beginning and later on gradually collect more information by giving away even better offers. Susan: Right, so don’t make the wall too high in the beginning, and also don’t think that the first opt-in is one and the only opt-in that you’ll ever be going to have in your final. It’s really a series of continually having people self qualify themselves into different segments and different engagement buckets. Steve: Along the same lines what’s your view on single versus double opt-in? Susan: You know it’s hard to get double opt-in, it does create an extra layer, but it’s so hard because as a marketer I just want to get that email as quickly as possible. I really want that myself, but on the other hand I do see that when it’s double opt-in the results are outstandingly better, and you will get much higher deliverability rates, you will get much higher open rates. At the end of the day it’s like, are you really– don’t get pulled in by the vanity matrix. So what is your matrix in this case, is it your subscriber list size, or is it your open rates, or is it– what is it that really matters to you? Does the open rate matter to you that much, does the subscriber list size matter to you that much, or do at the end of the day the conversions or the buys really matter to you the most? You can have actually higher revenue amount with a smaller list if your list is really engaged, if 100% of those emails are going through, and if 60% of that list is opening your emails. I would rather have that personally than a huge list with low open rates, low click through rates, and dismal engagement rates. Either way I’m very enticed, it’s just like short terms wins. I want to get the email right now. More and more I’m trying to encourage all the companies that I work with to go with double opt-in. By the way there are some things you can do to encourage the opt-in to complete, so I recommend people to include very clear instructions and motivation on the thank you page after they sign up, after your subscriber signs up to direct them to complete that second level of opt-in. Steve: What’s a good example of motivation? Another way to do it is also just, I’ve seen more and more marketers do this, I don’t know if you are doing this yourself Steve, but I’ve seen people link directly to the confirmation email search result in people’s Gmail inbox, and their main inbox. Steve: I have not tried that, no, is that working well? That might be something I’ll try. Susan: I think it works, I think it also can’t hurt, and it’s really simple to implement, and even if not all of your subscribers are using Gmail, even if it only gets you like 5% or 10% more opt-in, that is 5% or 10% more double opt-in, and I think that’s worth trying no matter what. Steve: Interesting, okay, so this link only works for Gmail though, right? Steve: Yeah that’s what I was thinking. Steve: Interesting, what are your views on using like these trick triggers in subject lines, so for example like pretending like it was forwarded to you or pretending that you are applying to an existing email, what is your feeling on that? Susan: I think it depends on how you use them, they work really, really well for me personally, but I wouldn’t use them for every type of email. For example, I think it has to be really in context, and it has to make sense; it has to be natural as well. For example if I want somebody to RSVP to a webinar, and the first email, you know I send the first email about the webinar, and then a whole bunch of people don’t see it. I probably wouldn’t do it if it’s you know something like a direct a sales email, like forward, hey the hard sales here and now or something like that. That wouldn’t really make sense just because it doesn’t fit in with the natural way that we would use forward and RE in our personal email, but the fact of the matter is it does work, as long as you are being genuine and outright spammy, it does work. Steve: What about in terms of emailing the people who haven’t opened your emails, so first of all 2 questions, one would you use this tactic, and then 2 how soon after the initial send would you send to your un-opens? Susan: I would definitely retarget the un-opens, sorry, I just call it retarget. I would resend to the un-opens, and I would also, I would — it depends on what you are selling if it’s worth it. But you might try also doing actual ad retargeting to the un-opens. There are a variety of reasons why people don’t open their email, and most of the time it’s much simpler than you think, it’s just because they didn’t see it. And so it’s kind of like that Twitter and Facebook newsfeed issue we were talking about, and people just miss it, and it’s not because it’s not relevant to them or they are not a great potential customer in the making. But you have to help them along before they can be helped along they’ve got to open your email. So I definitely would resend to the un-opens and I would also use — my basic assumption is people don’t open their email because attention is lacking. And so if I want to resend the un-opens the main thing I need to optimize for is getting attention right away in the subject line. If that means using a forward where appropriate I would use forward. If that means using RE in a subject line where appropriate I will use RE. If that means using better deal personalization, a company personalization I would do that. Steve: And how soon after the initial send do you resend the un-opens? Susan: We try to do it the very next day, maybe not the very same day depending, but it could be due to the time of day, it could be due to another factor, so maybe change that up a little bit and follow it along closely. Steve: Okay, and then one final question because I know you have to go pretty soon. In terms of split testing your email, is that something that you do and then how — like what’s your procedure for split testing if you do, do it? Susan: I do, do split testing. I like to do split testing on the subject line, because I have seen some pretty — you always think basically no, I don’t need to split test, I got this, I am a seasoned marketer. But actually the results always surprise me, so I think it’s worth doing whenever you’ve got the time. And I basically just live it up to my email marketing tool to do it for me. I personally use HubSpot in my current role at 500 Startups. And I wish I could say something smarter, but HubSpot just kind of makes it really easy. I set up my two tests, and I hit go and it sends it out to 5% of the list, and whatever is the winner it sends out to the rest of the list. Steve: Okay and in terms of just that 5%, you just let HubSpot choose? Steve: Okay so there is no specific targeting there? Steve: Okay interesting, okay. And before you go what mistake are you seeing a lot of people making with their email marketing that just kind of like a quick wind that you can leave the listeners with? Susan: Well I hope this isn’t too repeating myself, because I say this in a lot of places. But then again I see the mistake continuing to persist, and that is including large images in your emails is the number one way to make sure your recipients never see that email. And never get attempts to click through of course. And so this is one thing that I specifically called out Steve’s email marketing for, because I love that although there is a lot of opportunities to include buttons and length, snippets of landing pages and pictures of himself, or pictures of his product, or a picture of a part of a video thumbnail to watch a webinar. You Steve you successfully resisted all of those temptations, and you’ve kept your emails just text only. Not plain text because they are still being trapped, but text only. And that just gives you the highest possibility of getting through to the inbox, and to the main inbox that you possibly can get, and that’s the most important thing. That’s more important than branding, that’s more important than your logo, and that’s more important than any pictures. Now if you are in ecommerce there is one caveat that’s a little bit difficult. If you are having a very product focused ecommerce, so you are selling some beautiful product where the picture of the product is really critical to its sale and to its success, and you feel like you really have to include an image, then at least chop out all other potential design elements like all kinds of unnecessary background boxes, borders, logos, headers, footers, all that stuff that you don’t need so that really slim down your email. If you want to include that picture, include the picture of your product but include one picture, and then let people go to a landing page where they can browse other things, instead of trying out to put the landing page into the email, so that’s the mistake. The email itself is not your landing page. Steve: Interesting, so you are advising the use of no images for your email if possible even for ecommerce store? Susan: If you can yeah, I would advise if you can, depending on what kind of ecommerce it is. If you can tell the story with your words and get people — don’t think of the email as doing all the selling for you. The email is just passing the button to your landing page. And on your landing page go ahead and put up all the beautiful pictures and branding and logos that you want, that’s what it’s there for. But the email can succeed in its job of passing a button if it’s all way down like think of a sprinter right, you got to keep it light. Steve: Yeah I tend to ignore those emails to kind of think of it when it looks like a magazine article, and I’m not in the mood to shop, so yeah I can see that. Hey Susan I know you got to run, so I just want to thank you for coming on the show. Where can people reach you if they have any questions about what we talked about today? Susan: Well, they can go to my site which is emailforstartups.com if they want to learn more specifically about email, or they can always find me on twitter @susanfsue that’s my first name Susan the letter F as in fantastic. And then my last name Sue, Susanfsue, so that’s me on Twitter, always feel free to send me a message or a mention there, and I’m happy to help out with anything else. Steve: Cool Susan, thanks for coming on the show, I really appreciate it. Hope you found that episode useful. Email marketing is such a huge part of my business, so whenever I come across someone who knows email really well, I instantly want to talk with him to discover their latest strategies. For more information about this episode, go to mywifequitherjob.com/episode134. Once again I want to thank sitelock.com again for sponsoring this episode. If you run your own hosted online store, or any website for that matter that handles monetary transactions, you should give SiteLock a look. They can also help your site with site speed issues as well. Did you know that ecommerce sites that take longer than 5 seconds to load often shed customers? SiteLock offers a service called TrueSpeed which is a content delivery network that can increase download speeds by up to 50%. So go check out SiteLock today at sitelock.com/mywifequitherjob. Once again that’s sitelock.com/mywifequitherjob and get your first three months free. Once again if you are interested in starting your own online business, head on over to mywifequitherjob.com, and sign up for my free 6 day mini course, where I show you how to start a profitable online store right away. So sign up right there on the front page, and I will send you the course via email immediately. Thanks for listening.